My beloved Guru, Sri Chinmoy, passed away yesterday at 7am, at his home in New York. Sri Chinmoy has been my meditation teacher — the inner and outer inspiration of my life — over the last decade. On a human level I am naturally shocked and sad at his sudden earthly parting, but inwardly I will never in this life fathom the inner gifts of inspiration he has given me through his teaching. More than human sadness, which will pass in time, I feel gratitude, gratitude, gratitude for spending these years in the balm of his wisdom. That gratitude will never end. His teachings will always be with me, and I hope only to make my own life — my actions, creations and interactions — a tribute to them. The end came in his modest home in the Jamaica Hills section of Queens at 7a.m. – just a day before the Nobel Committee was to announce if he had won this year’s Nobel Peace Prize. 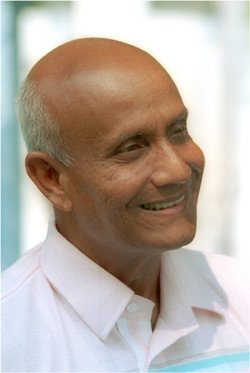 Chinmoy was nominated for the honor in recognition of his “ceaseless work for the United Nations” for more than 30 years. Thank you, Ralph, for your heartfelt comments. I hope this will always be true; I could wish for nothing more beautiful or meaningful in my life. It is said that when a teacher passes away, their essence leaves their body, and enters the heart of their devotees, so they may continue to guide and direct the student, and always be present for them. May you always experience his love and compassion as your own. Thank you so much, Princess Haiku, for your most beautiful message. It really touched my heart. Kindness and oneness are yet more valuable in these times. My condolences on the loss of your teacher. May his wisdom bloom and continue to grow in your heart.